We welcome you to the The Anchorage Stillbay / Stilbaai - South Africa. We offer you a flash photo album of 55 photos. Still Bay is a popular seaside holiday destination, especially over the summer holidays. Still Bay has a fine swimming beach on the Indian Ocean and offers excellent boating on the river. There are a number of lovely places to swim. They include the beach just to the left of the river mouth and the beach just to the right of the river mouth where all the old houses are. There are a number of magnificent walks in and around the beaches. Always walk with someone. Dogs are not allowed on the beaches.You can take a 10km walk from Stilbaai to Jongensfontein or you can take a walk from the east side up to Preekstoel along a stunning beach. Attractions: Beach, Biking, Bird Watching, Boating, Kite Surfing, Canoeing, Dinghies, Deep-sea Fishing, Diving, Fishing, Golf, Hiking, Mountain Biking, Nature Reserve, Outdoor Adventures, Paddle Skiing, Sundowners, Swimming, Walks, Whale Watching. 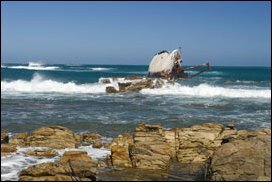 What To Do In Stilbaai : It is well known in Southern Africa as a quiet little seaside village where most residents have retired and many visitors arrive to relax from the stressors of city life. Why not reserve Stilbaai accommodation and get the feel of the laid back environment. Through the pride of the residents this town remains beautiful and especially so during the spring months. The authorities are very strict when it comes to the environment. The magnificent beaches and rivers transform themselves during the Christmas and Easter holiday periods as thousands flock to this seaside village. Still Bay is definitely not an appropriate name during these periods. It is difficult to find vacant Stilbaai accommodation during the times.. Initial impressions : When approaching Stilbaai you do so from a road which branches off the N2 and then winds it�s way down into the village.. The road is close to the Goukou river and every now and then you get a beautiful view of the river and sometimes the sea. You can take a boat trip up the river for a distance of about 17km. As you get close to the mouth you will notice Stilbaai accommodation establishments which are on either side of the river. The beaches : There are many beaches both to the East and to the West with magnificent white sand. The ancient fish traps occur in a number of different spots and make for stunning photographs. Lappiesbaai is Stilbaai�s pride. The beach has received blue flag status for the past four years. It is a lovely beach which looks stunning and which is also a much safer beach for swimming and just having a lazy time. Lappiesbaai is complete with trails, bird watching and whale spotting. Make your booking at Stilbaai accommodation and come and enjoy our coastline. Stilbaai Village : The River divides the town into two parts namely the East Bank and the West Bank . The East Bank is much smaller and most of the shops are centred in the West Bank . Most of the Stilbaai accommodation is present on the West Bank . The West Bank also has a small harbour for fishing boats. Natural reserves : Close to the village is the Geelkrans Nature Reserve. The 165 ha of fauna is something one should visit. Another good visit is Palinggat which is where the Eels live and they are fed each day. It is close to many Stilbaai accommodation sites. 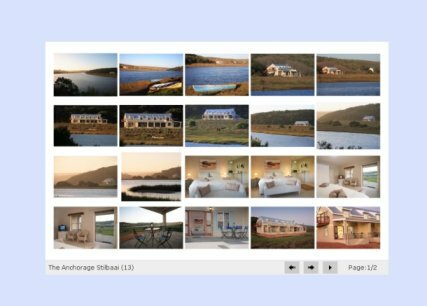 Stilbaai has some beautiful B&B�s, Self-catering establishments and Guest Houses during the season these places are fully booked. The standards are high and the homes are very competitive. Most of them are established in stunning positions overlooking to river and/or sea. Jongensfontein just down the coast has some beautiful spots to stay. If you have never been to Stilbaai then please make a point of visiting us and staying in the accommodation we provide. If you have any questions or comments please call us on +27-(0)28 754-3730 or fax us at 0866516651 in south africa or e-mail us on info@theanchorage.co.za. Revised: 25 Jan 2010 13:55:05 +0200.